MUSIKMESSE 2016: Pigtronix, the zany effects company behind stellar stompboxes such as the Philosopher's Tone and Infinity Looper, has announced its first effects pedal power supply, the logically titled Pigtronix Power. The supply is all-analogue, offering eight fully isolated outputs for low-noise operation, and covers power requirements spanning 9V to 18V, as well as up to 300mA for power-hungry digital pedals - switchable 115V and 230V operation means it works worldwide, too. 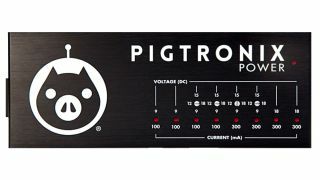 Pigtronix Power is available now for $299 - full specs are below. Dimensions: 8 5/8" x 3 ¼" x 1 5/8"